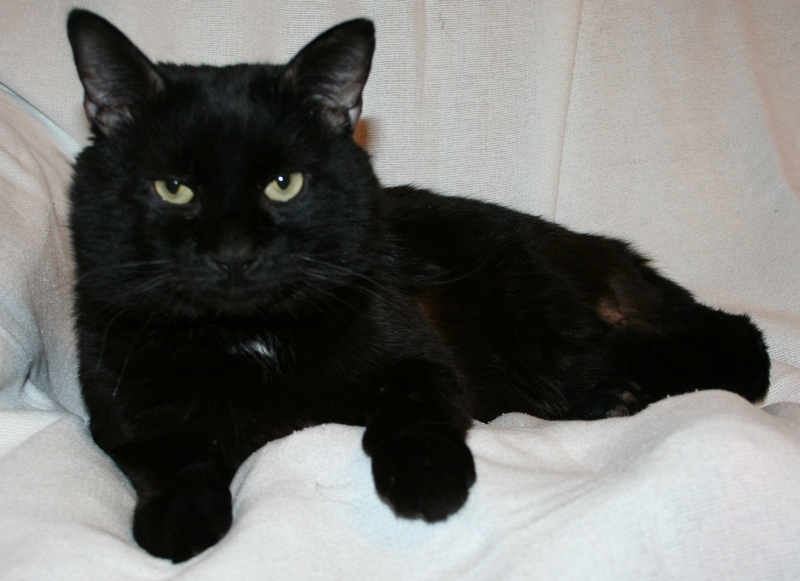 Maverick is a friendly stray that was abandoned by his family about a year ago. 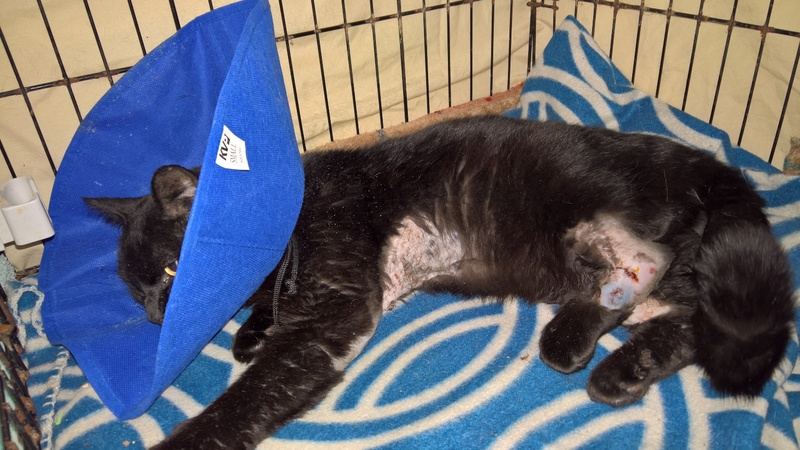 Surviving on his own was hard enough and then he suffered a viscous animal attack that nearly killed him. He was very lucky to get away but he did not get away unharmed. BDRF got the the call to help an injured stray. Once we saw him we realized he was critical and needed immediate care. He had several bite wounds on his legs, the worst on his left back leg. Unfortunately he had been in this condition, dragging himself to food and under a porch, for 7 to 10 days. His wounds were badly infected. Maverick was also weak and thin and he was beginning to lose the battle. We immediately brought him to the vet, hoping he could be saved. One bite wound had abscessed and already ruptured leaving a quarter size hole at his elbow. The infection in his back leg was deep in the joint and has swelled to 3 times it's size. The vet was not sure the leg could be saved. At this point we needed to begin by saving the cat and getting him strong enough to survive a major surgery if amputation became our only option. Maverick spent the next couple of days at the vet getting intensive care as the work to give him a better life began. His wounds were cleaned up and he was stitched back together. 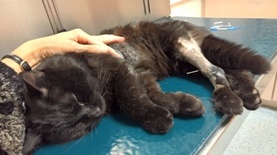 They worked to save his leg with medications, compresses, acupuncture and laser treatments. Eventually they had the idea to use a special bandage infused with an antibiotic and we finally started to see some improvement. He was far from out of the woods but I was able to take him home and continue his care giving him medications and and leg soaks. 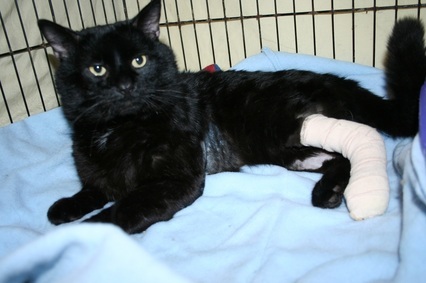 Maverick was unable to use his leg at all and would only get up to use the litter box and that was nearly impossible for him because getting up was excruciatingly painful. 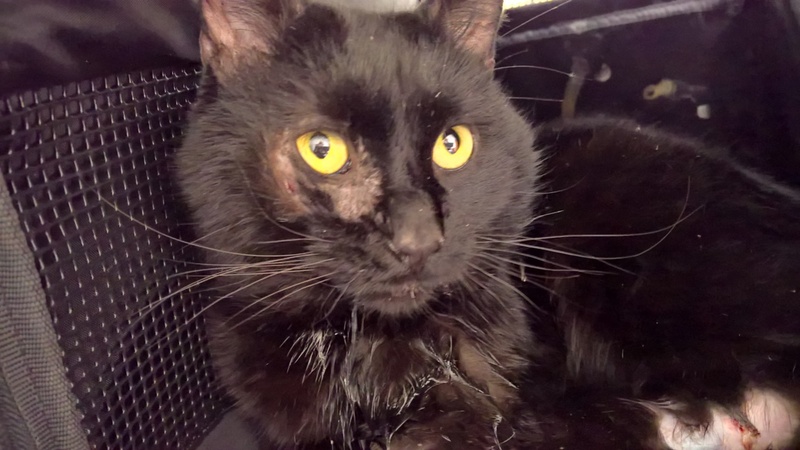 In all of the years I've been rescuing hard luck cases I've never seen a cat in this much pain, yet through it all he was kind and gentle and accepted his treatments and care. I cried for this cat more than a few times. I was very worried he wasn't going to survive and everyone at this point was almost positive he was still going to lose his leg. After being home for about 2 days he improved slightly and gave me some hope. But soon after he went down hill again and I rushed him back to the hospital. Once again we discussed amputation but wanted to give him more time. He had more acupuncture, laser treatments and the special bandage applied. To everyone's amazement he quickly started to turn around!! Not only was Mavericks general health improving but the swelling finally came down in his leg and the pain was greatly reduced. As the days passed Maverick surprised us all and began walking on all 4 legs, he had a limp but he was using the leg! The same will to live that kept him alive during the fight was helping him to get better! The vets were excited that he was responding so dramatically to the treatment. We were now confident that Maverick was going to survive and keep his leg! Maverick is now healthy and walking perfectly! He is incredibly handsome, good natured and sweet. Without generous donations Maverick would have died suffering and alone. What a shame and a great loss that would have been.